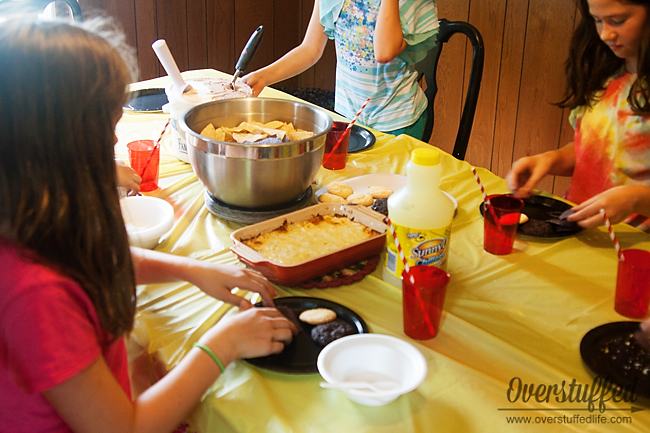 A few weeks ago, Chloe hosted her summer book club. 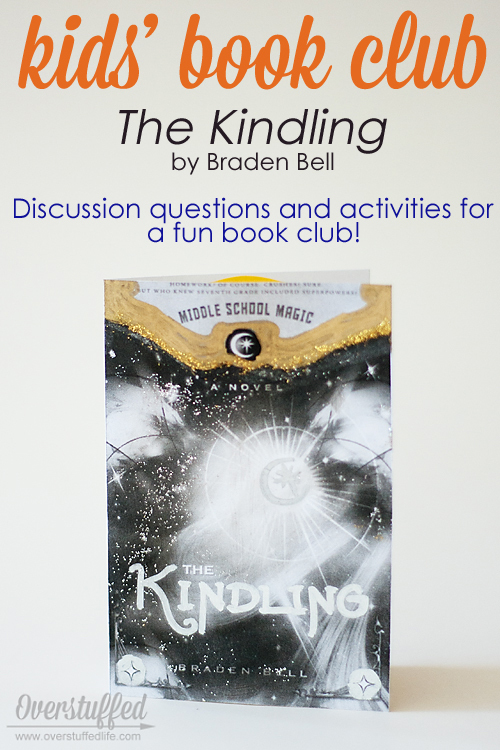 The book she chose is the first book in what she has deemed her favorite book series of all time: The Kindling by Braden Bell. 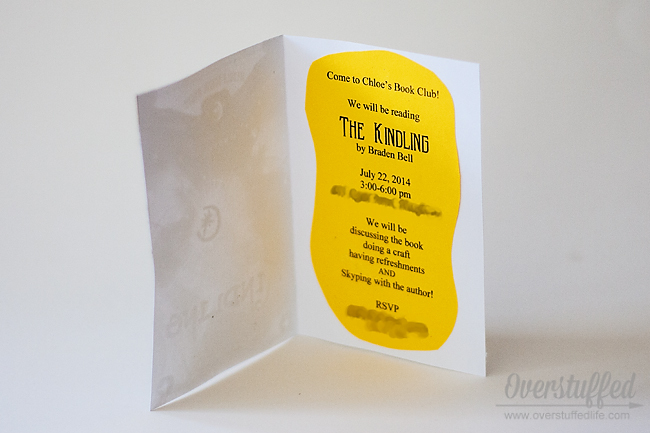 Chloe's idea for the invitations was to print out the book cover in black and white and then decorate it with gold and silver paint pens, as well as glitter. I thought they turned out really cute! Chloe and I had a hard time deciding what to do for food. 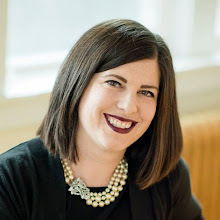 There is a lot of pizza eaten in the book--completely normal for a story about middle schoolers!--but Chloe didn't want to serve pizza because it's too obvious. Plus, she's gluten-free, and she always hates to call attention to that fact by having to eat something different than everyone else. So, pizza was out. Instead, we chose to highlight the theme of light and dark in the book and chose foods that are the same, but come in both light and dark. Chloe made two batches of gluten-free cookies from some mixes. One batch of sugar cookies, and one batch of chocolate cookies. 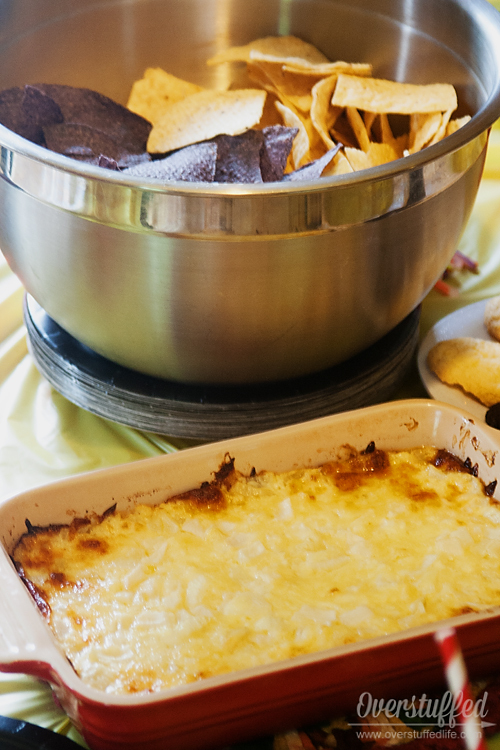 We bought yellow corn chips and blue corn chips and served them with Chloe's very favorite dip, which is mostly white in color (onions and swiss cheese). Finally, we had ice-cream, in both chocolate and vanilla. 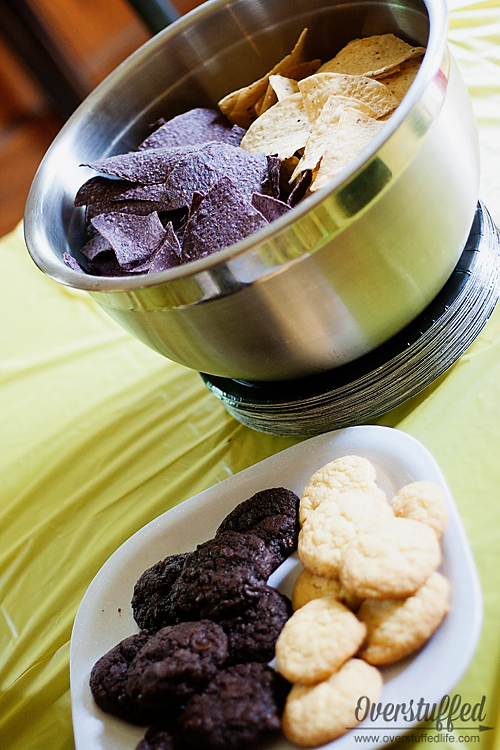 We used a yellow plastic tablecloth to symbolize the light, and black plates to symbolize the dark. It turned out really cool, and all the girls that attended enjoyed the light/dark symbolism. Chloe and I literally wandered the aisles at Michael's waiting for some inspiration. She vetoed nearly every idea I had come up with in the weeks leading up to the book club, and so finally I just took her to the craft store to see what we could come up with. 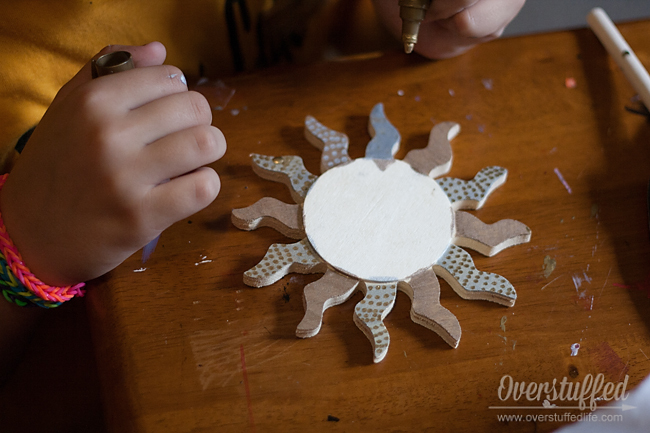 We settled on painting some wooden suns with silver, gold and glow-in-the-dark paint. 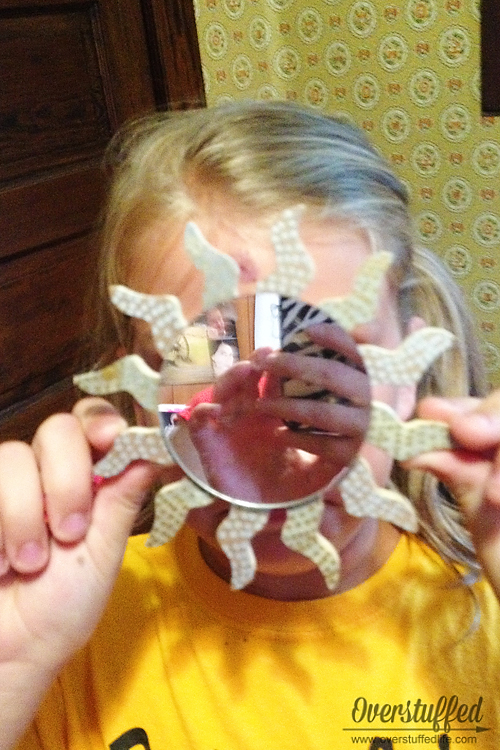 We then glued mirrors to them, and added a strong magnet to the back. Most of the girls who attended are starting middle school this year, so the idea was for them to use the suns as locker mirrors. We had to do the activity in stages in order for the paint to dry, so we worked on it a couple different times throughout the meeting. They all turned out really cute, though, and Chloe is very excited to use hers in her locker when school starts in a few weeks. Chloe changed up the characters, and instead of mafia, one person was assigned the role of "The Stalker" and instead of a cop, we had "Dr. Timberi." Both of these are important characters from the book, and it worked out well in this game. The girls had a blast playing it outside in our tent which we had set up to do a backyard campout in the night before. I have no photos because I was busy trying to referee the game! Here are the questions we asked, all of which really sparked some good discussion amongst the girls. 1. Who was your favorite character, and why? 2. What was your favorite part of the book, and why? 3. If you were a Magus, what do you think your Sigil would be? 4. If you were a Magus, what would you think about in order to open your portal? 5. What did you think about The Stalker? Were you scared of him? Why or why not? 6. Who was your least favorite character, and why? 7. If you were Conner, Lexa, or Melanie, how would you have felt when you found out you had kindled? The rest of the discussion time was spent coming up with questions of their own to ask the author. 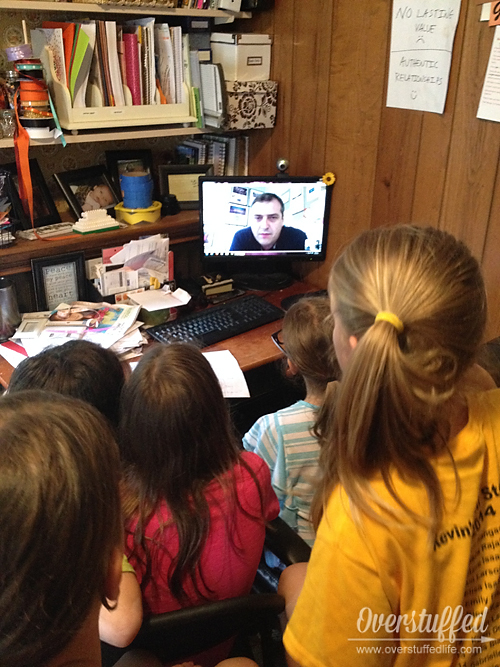 He was gracious enough to Skype with the girls at the end of the meeting. And let me tell you, they LOVED it. They were a little shy with him (some a little more than others), but they were all deeply impacted by their conversation. And they came up with some really good questions, too! Please excuse my perpetually messy desk and office. 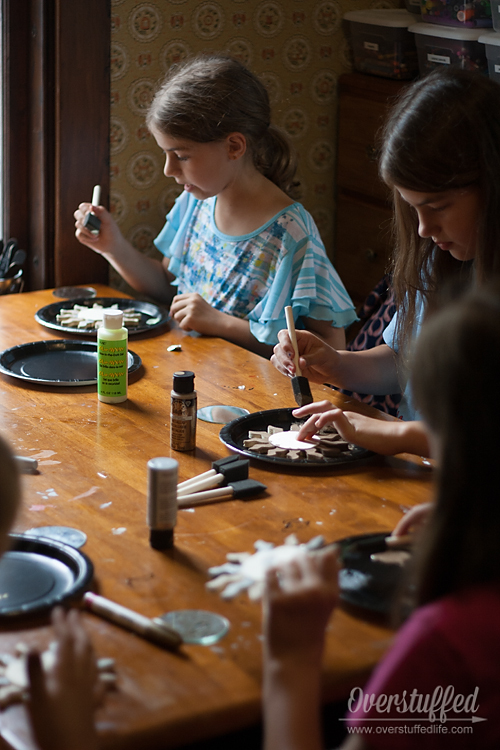 We love doing these summer book clubs with the girls, and their friends all enjoy them a lot, too. 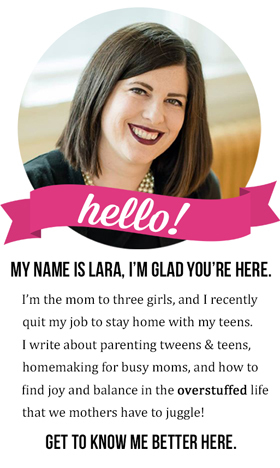 If you are interested in learning a little bit more about how we go about planning them click here: How to Host a Summer Book Club for Kids. And if you are interested in reading The Kindling and the other two books in the Middle School Magic series, here are links for the books. Enjoy! How fun! I loved being part of that--thank you for including me. I love all that creativity! And I'm laughing out loud about some being shyer than others. I know, right? Chloe loved Skyping with you, and I've heard back from some of the parents how impactful it was on their daughters to speak with you. So THANKS again! 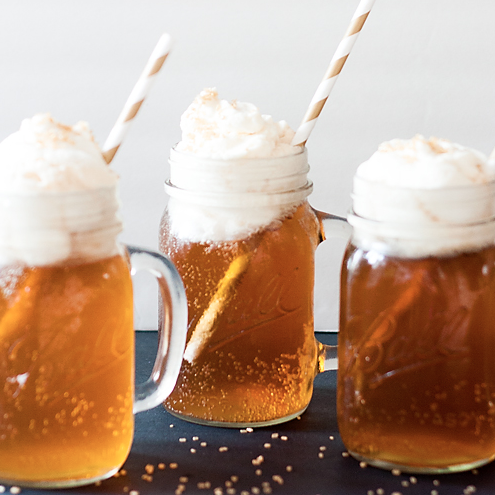 I've loved following all the book club ideas--I'll have to remember this for my girls next summer.